For all who remain intrigued by the legacy of the Civil War -- reenactors, battlefield visitors, Confederate descendants and other Southerners, history fans, students of current racial conflicts, and more -- this ten-state adventure is part travelogue, part social commentary and always good-humored. When prize-winning war correspondent Tony Horwitz leaves the battlefields of Bosnia and the Middle East for a peaceful corner of the Blue Ridge Mountains, he thinks he's put war zones behind him. But awakened one morning by the crackle of musket fire, Horwitz starts filing front-line dispatches again this time from a war close to home, and to his own heart. Propelled by his boyhood passion for the Civil War, Horwitz embarks on a search for places and people still held in thrall by America's greatest conflict. The result is an adventure into the soul of the unvanquished South, where the ghosts of the Lost Cause are resurrected through ritual and remembrance. 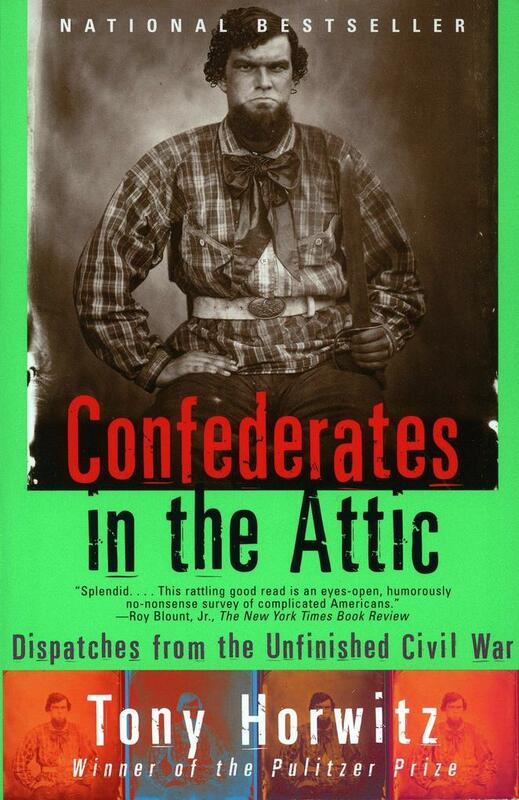 Written with Horwitz's signature blend of humor, history, and hard-nosed journalism, Confederates in the Attic brings alive old battlefields and new ones 'classrooms, courts, country bars' where the past and the present collide, often in explosive ways. Poignant and picaresque, haunting and hilarious, it speaks to anyone who has ever felt drawn to the mythic South and to the dark romance of the Civil War. Tony Horwitz's new book, Spying on the South: An Odyssey Across the American Divide, is available May 14th, 2019. Tony Horwitz is a native of Washington, D.C., and a graduate of Brown University and Columbia University's Graduate School of Journalism. As a newspaper reporter he spent a decade overseas, mainly covering conflicts in Africa, the Middle East, and the Balkans for The Wall Street Journal. Returning to the U.S., he won the Pulitzer Prize for national reporting and wrote for The New Yorker before becoming a full-time author. In addition to Confederates in the Attic, his books include the national and New York Times bestsellers, Blue Latitudes, Baghdad Without a Map and A Voyage Long and Strange. His latest book, Midnight Rising, was named a New York Times Notable Book. Horwitz has also been a fellow at the Radcliffe Institute for Advanced Study at Harvard University and a history columnist for Smithsonian magazine. He is currently the president of the Society of American Historians. Horwitz lives in West Tisbury, Massachusetts with his wife Geraldine Brooks, their sons, dogs and alpacas. History / United States / Civil War P… Travel / Essays & Travelogues Social Science / Customs & Traditions History - U.S.